Few subjects have generated more buzz throughout the healthcare world during the past year than the so-called meaningful use of EMRs. Part of the reason for that is because it’s still a work in progress. 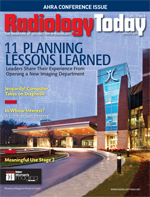 Radiologists, like other physicians, are actively interested in the ultimate details of the rules—both to improve care and get their share of incentive payments for achieving meaningful use. The stage 1 rules, which were finalized in July 2010, are basically an introduction. Stage 2, which is still in its comment phase, will add more detail. Although specific requirements for diagnostic medical image transfers are not currently under consideration, most radiologists are eligible for the meaningful use incentive program and eventually will be subject to potential penalties. As expected, many physician organizations are offering opinions about how best to implement the next phase. Michael Peters, director of legislative and regulatory affairs for the government relations and economic policy departments of the ACR, says a realistic goal isn’t specialty-specific requirements but rather increased relevance and flexibility for specialists. Peters doesn’t expect to see any specialty-specific rules because they would be too cumbersome to implement, but he believes more scope-of-practice–based exclusions from certain functionality measures would be a commonsense way to allow flexibility in the system. This approach would be helpful to many specialists, including radiologists, whose practices typically differ greatly from primary care physicians’ practices. Up to this point, the lack of specificity in stage 1 hasn’t been a problem for most radiologists because individual physicians don’t have to do much to comply; they just need access to a certified EHR, and anyone at their facility can input the data elements and perform the health information exchange and security checks needed to qualify for incentives. But as meaningful use evolves, more requirements will be put in place. How much more will be required is still being decided. Part of the anxiety surrounding meaningful use is that the rule-making process is long and arduous, not to mention poorly understood. Peters says the ACR actively participates in all aspects of this process, including monitoring numerous advisory committee and workgroup meetings every month, regularly communicating with regulators and legislators, and submitting formal comments and testimony when and where appropriate. Later this year or early next year, the stage 2 proposed rules are expected to be published. The final rules probably won’t be published until the summer of 2012. Peters doesn’t believe the stage 2 rules will drastically change how the CMS and the ONC address specialties, but he does believe the CMS and the ONC will need to take specialists’ concerns into account, as they partially did with the creation of exclusions and discretionary menu measures in stage 1. Peters says all specialties are essentially in the same boat when it comes to meaningful use, and he expects that, as the penalty phase of meaningful use approaches in 2015, pressure from specialists will increase unless there is sufficient flexibility built into the system. Ultimately, in addition to greater flexibility in meeting the requirements, the ACR would like to see imaging-relevant measures that provide incentives for items such as capturing images, sharing images, and sharing structured reports, although there’s no guarantee that this kind of data will be part of stage 2. However, the May 13 meeting of the ONC’s HIT Policy Committee Meaningful Use Workgroup on meaningful use and specialists raised the possibility that medical imaging will be given a more prominent role in meaningful use. Previously, the CMS and the ONC hadn’t paid much attention to imaging, but the workgroup’s interest seems to have been piqued. Peters says he’s cautiously optimistic that regulators and advisers will recognize the value of including imaging data in EHRs.